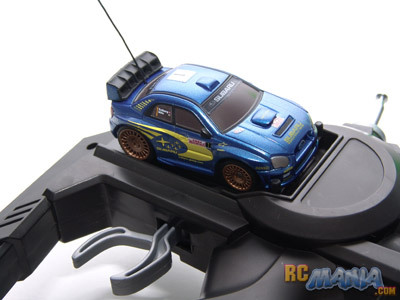 It's been awhile since really something new came out in the ultra-micro racing RC world. The X-Trek Pro is a 1/60th scale, less than 3" long, that packs a surprising number of features, or so the box says. 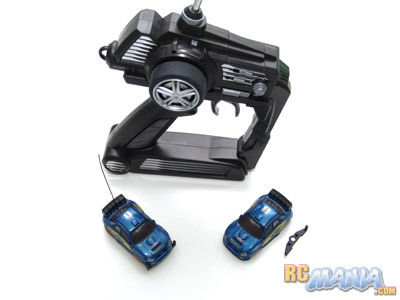 When you open that box, you get one pretty fancy, pro-style "pistol grip" transmitter and one tiny little car. Surprisingly an extra body is always included, which you can repaint yourself or just keep as a spare in case you, oh I don't know, maybe step on the original? The bodies have a lot of really fine detail and look great, even if they're not quite scale-accurate in proportions. 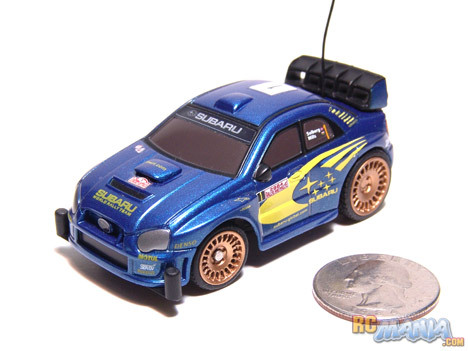 The tires are real rubber, and at least the Subaru WRX World Rally Championship model that I got has actual tread on those tiny tires. Seems like a lot of work went into designing these. A number of different body styles are available, too, not just Subarus. Like the original ultra-micro RCs, the Tomy Bit Char-G or Hobbico MicroSizers (same thing, different name), or the later, more familiar Radio Shack ZipZaps, the X-Trek pro charges right from the controller. On the back of the controller is a proper charging dock that you just slide the car onto for a short time to juice up the built-in micro battery pack. This is super-easy and foolproof. I love not having to change batteries in a car, and not having to have a separate charger that takes up the space of 2 power outlets and is always in the way. Being able to charge & go no matter where you are is a big plus. The car also has a peculiar front bumper preinstalled, plus a spare. It's interesting because there are two vertical pillars on either corner. We'll look at the purpose of this shortly. What's more, both the transmitter and the car have "tri-band" technology, a 3-position switch that allows you to change the radio frequency. This way, any 3 people can drive any 3 X-Trek Pro's at the same time in the same place, even if they're the exact same car. Nice! The X-Trek Pro has two trims on the controller, one for steering and one to set neutral throttle trim. This is a true pro-level touch and makes it easy to get the car tuned just right. As soon as you ease onto th throttle, the quality of the X-Trek Pro's electronics shine. It has true digital proportional speed as well as steering! You can go as slow as you want or as fast, or anything in between. Speaking of fast, it's fast. It's really faster than anything this size needs to go, and it has so much power that it can do donuts forever if you crank the steering to one side from a start and jam on the gas. If you want to use a little finesse, the precision digital steering (with the help of the digital trim to get it just right) and grippy tires let you drive any course with whatever skill you have as a driver. For a mere "toy," this is one serious tiny machine. You can get multiple track sets to make any size or shape of crazy race course, from simple oval to complex grand prix style, complete with bridges, s-curves, and pit stops. The X-Trek Pro RC car, itself, is a solid piece of quality engineering, fast and agile, easy to use, and capable of handling the demands of even the best driver. The track system, then, just takes it to a whole level, introducing something never before seen in RC. To be fair, there were track setups made for the earlier Microsizers and such, but these consisted of baseplates or interlocking edge pieces that weren't designed to keep the cars running on them. Plus, most ultra-micro RCs don't have digital proportional control, so it was hard to make them take different-sized turns. The X-Trek Pro does it all! This is a fascinating play system made by a company that's always innovating and bringing only the very best technology to kids and adults alike. The only thing that I can say bad about the whole thing is that the cost can get a little high if you get a few cars plus a couple track sets, but I feel this is a case where you absolutely do get what you pay for!